Your baby will look adorable with this Candy Pink Crochet Headband that already has a Pink Daisy attached to it. Just slide it over her forehead and she's ready for any outing. 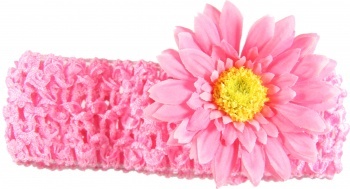 The pink daisy also has it's alligator clip so it can easily slide on and off the headband if needed and can also be worn alone. This is a two for one deal.